Hi everyone! 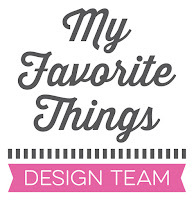 Today is the second day of the My Favorite Things December release countdown. This release is packed with amazing new products and I hope you’ll have fun with our preview projects! For the card base, I used Smooth White cardstock. For the front panel, I used Sno Cone cardstock and added interest with the Stitched Strip Die-namics. I adhered the panel to the card front using foam adhesive. 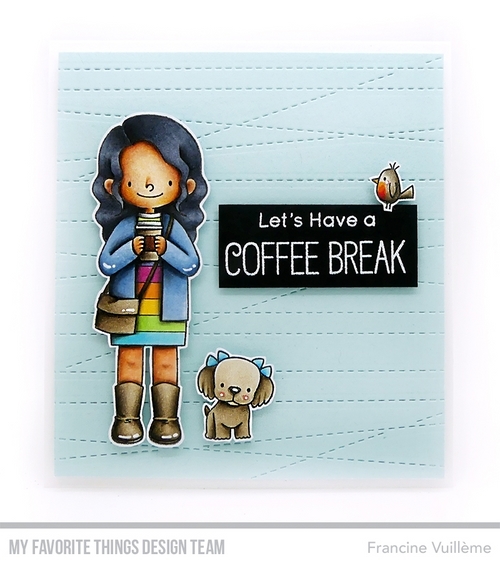 The sweet girl, the dog and the sentiment are from the Friends at First Sip stamp set. The small bird is from the Safari Friends stamp set. Really cute card, Francine! Love the stitched background, too! LOVE this, good grief, your coloring is spectacular. Who could refuse an invitation from such a lovely lady! Love the coloring and the use of the Lined background! I have the Stitched Strip Die-namics and I love the subtle texture it lends to your card. Your rainbow dress is magnificent!